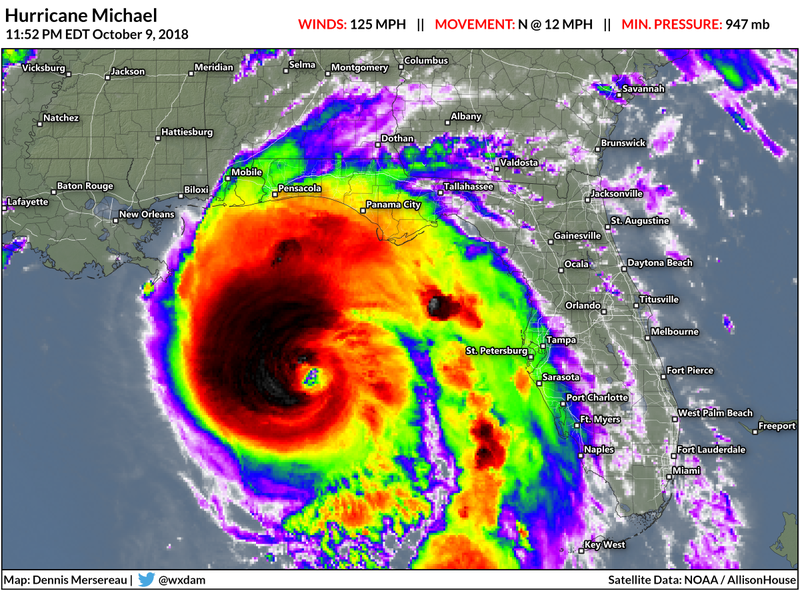 Hurricane Michael is an extremely dangerous storm in the eastern Gulf of Mexico this evening. The National Hurricane Center now expects its maximum winds to reach category four intensity by landfall on Wednesday afternoon. The storm will be one of the strongest ever recorded at landfall on the Florida Panhandle, and one of the strongest landfalls we've ever seen so late in the year. Michael poses an extreme risk to anyone who chose (or had no choice but) to stay ahead of the storm's expected landfall near Panama City on Wednesday. Hurricane Hunter aircraft flying through Hurricane Michael on Tuesday night found that the storm's winds had rapidly intensified to category four status. The storm has maximum sustained winds of 130 MPH with higher gusts. The storm's pressure fell to 943 millibars, down from 970 millibars this time last night. 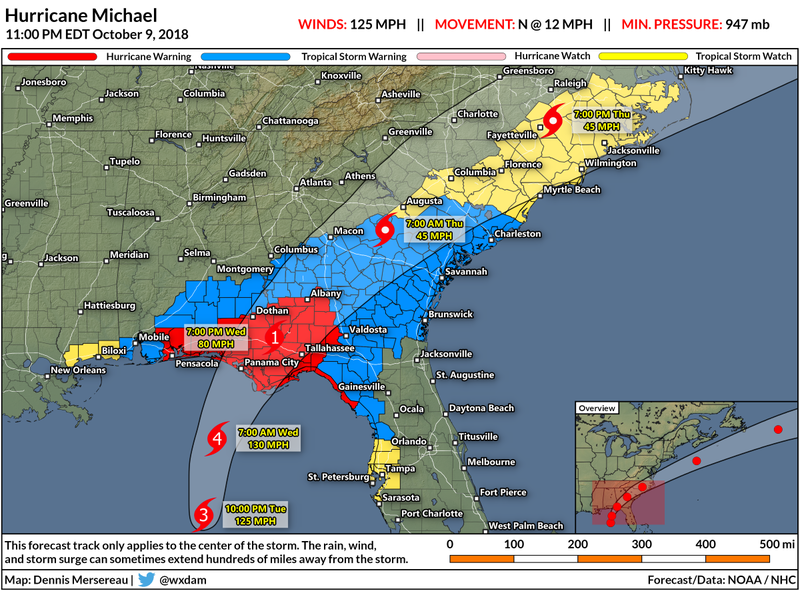 The forecast at 11:00 PM EDT Tuesday shows Michael making landfall around Panama City, Florida, on Wednesday afternoon, with category four winds. The storm will steadily weaken once it's inland, but it won't wind down immediately. Hurricane force winds are still likely in the eyewall as the center of the storm moves into southwestern Georgia. This hurricane is the real deal. It will take a major disruption in the internal organization of the hurricane (an eyewall replacement cycle or a sudden intrusion of dry air) to significantly weaken it before landfall. While it's possible, do not count on that to happen. The hurricane (and, by then, tropical storm) will accelerate as it pushes into the southeast, producing heavy rain and gusty winds. The chance for flash flooding and power outages from wind damage will increase from southwest to northeast as the core of the storm moves through Georgia and into the Carolinas. Once the storm leaves the North Carolina coast on Thursday night, it will speed out to sea as it loses its tropical characteristics. The storm will bring heavy rain, gusty winds, and rough surf to parts of the Mid-Atlantic coast through the first half of Friday as it exits stage-right. Here's what we need to watch as Michael makes landfall. The storm is forecast to make landfall with 130 MPH winds. This will cause tornado-like damage to a wide swath of Florida's Panhandle and southwestern Georgia along the path of the hurricane's eyewall. The parts of Florida and Georgia in the path of the storm's eye are heavily forested. This hurricane will result in a significant tree blowdown, blocking roads, damaging homes, and severing power lines that could result in widespread power outages that last many days or weeks after the storm. Hurricane Michael has a very large wind field. Tropical storm force winds (39-73 MPH) extend 300 miles across the width of the storm. Hurricane force winds extend 45 miles away from the eye. Many homes and businesses will sustain some level of wind damage, even those that are far away from the path of the eye of the storm. The above map shows the NHC's forecast wind radii for each timestep in its 11:00 PM Tuesday forecast. 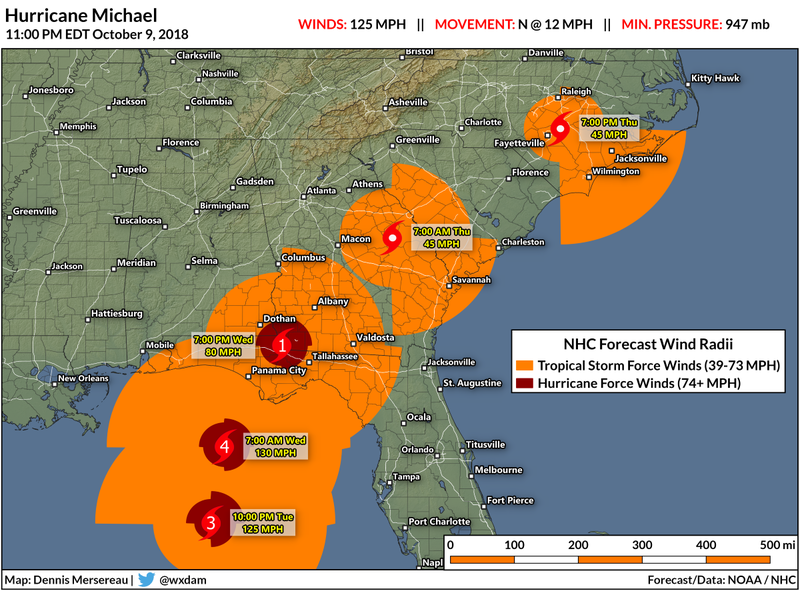 You can mentally fill-in the gaps between timesteps to get a rough idea of the expected swath of hurricane force (dark red) and tropical storm force (orange) winds as Michael moves through the southeast. For some reference on the kind of wind damage this region can see, Hermine made landfall near Tallahassee in 2016 as a minimal hurricane. Though its maximum winds at landfall were "only" 80 MPH, the storm caused considerable tree and power line damage as it pushed inland. Some residents near Tallahassee were without power for more than a week after the storm. The shape of the coast and marshy terrain of Florida's Big Bend—the concave coast between Apalachicola and Cedar Key that bends northward—makes this part of the coast exceptionally vulnerable to a storm surge. 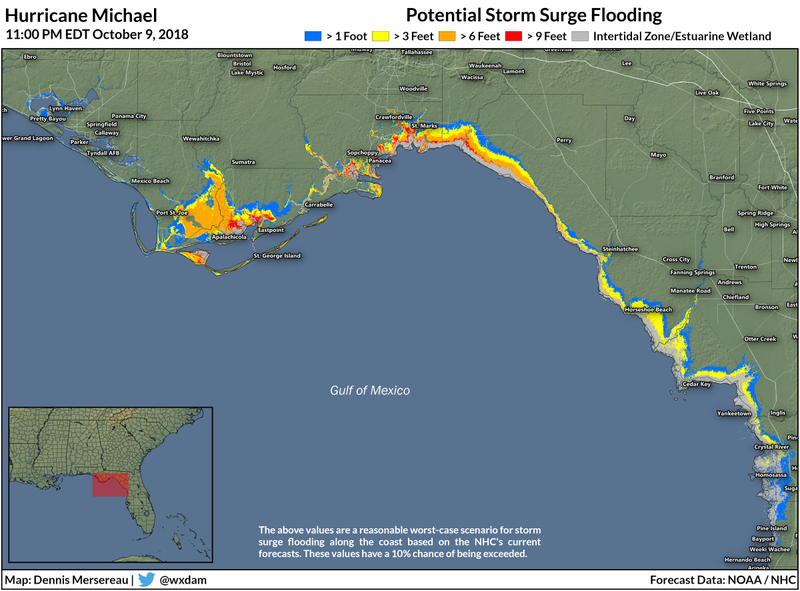 A reasonable worst-case scenario based on the National Hurricane Center's latest forecast would push a storm surge of up to 12 feet above ground level into the Big Bend. This part of the coast is not heavily populated, but thousands of people do live in these areas, so this is a life-threatening situation. Elsewhere along the coast, especially along and to the east of Michael's eye, a life-threatening storm surge of up to nine feet is possible. This kind of surge can easily inundate homes and businesses near the coast. The prospect of category four winds and a storm surge deep enough to submerge the first floor of homes and businesses puts those who didn't evacuate in a precarious position. Hurricane Michael will continue moving at a decent clip once it makes landfall. This will not be a repeat of Florence or Harvey, but any flash flooding is a serious threat to life and property. 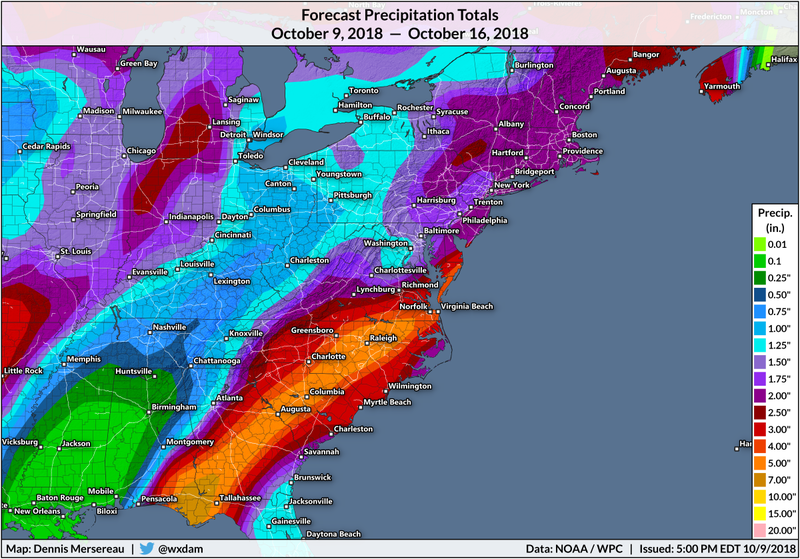 A swath of rainfall possibly exceeding six inches is possible along the path of the storm from landfall on Wednesday through its exit off the North Carolina coast on Thursday evening. The greatest rainfall totals are expected along the path of the core of the storm, but training bands of showers and thunderstorms could easily drop higher totals than those shown above. The ground is still saturated in areas that saw heavy rain from Hurricane Florence last month. It would only take a couple of inches of heavy rain in a couple of hours to trigger flash flooding in parts of the Carolinas. As we see with any landfalling tropical cyclone, there's a risk for tornadoes on the eastern side of the storm. The forward motion of the storm combined with wind shear can allow thunderstorms in the outer bands to produce tornadoes. The tornadoes that form in tropical cyclones happen quickly and don't give people in harm's way much time to react to tornado warnings. Michael took advantage of very warm waters, relatively low wind shear, and ample tropical moisture to attain its current strength. 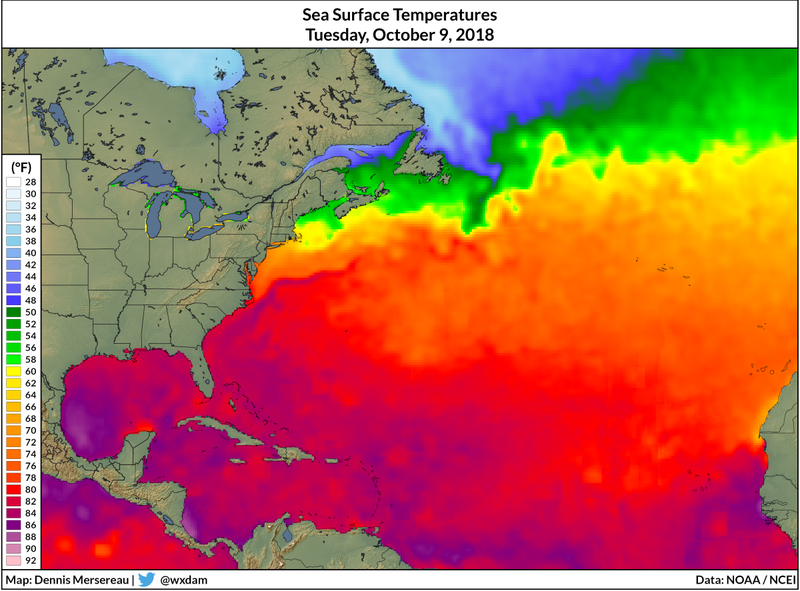 The Gulf of Mexico really hasn't seen many storms this year, and that's helped this storm tap into a deep reserve of warm water and explode to its current intensity. The only two storms to enter the Gulf this year were Alberto in May and Gordon at the beginning of September. The lack of storms churning the waters, as well as persistently hot weather right up through this week, has allowed the Gulf to grow warm enough to sustain a storm as strong as Michael. Storms this strong don't typically make landfall so far east along the Florida Panhandle. The most recent storms of this intensity to cause serious issues in the Panhandle were Hurricane Dennis in 2005 and Hurricane Ivan in 2004. Hurricane Dennis made landfall near Pensacola, while Hurricane Ivan came ashore in Alabama. The intense winds and storm surge of both storms laid waste to the western Florida Panhandle. The last time a major hurricane made landfall within 100 nautical miles of Panama City, Hurricane Michael's forecast landfall point, was in 1894. In fact, all three major hurricanes that hit this part of the Florida Panhandle occurred in the 1800s. 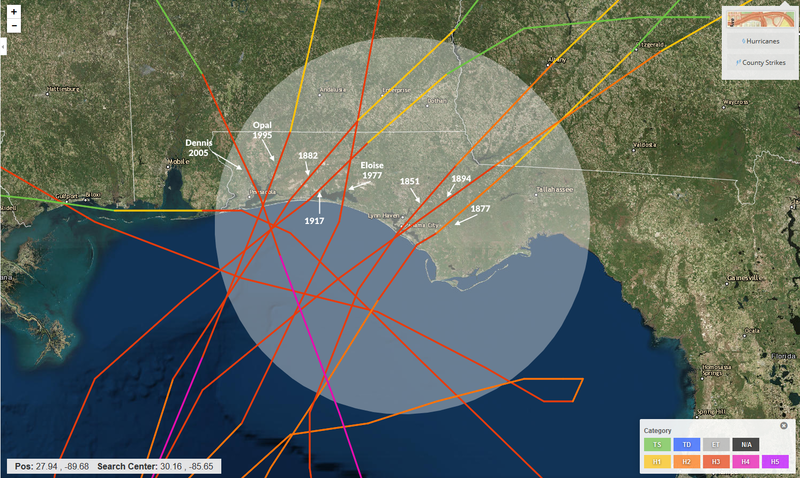 No hurricane with winds of category four intensity or stronger has ever made landfall along the Florida Panhandle since reliable records began in the 1800s. This storm, if it maintains its intensity through landfall, will be unlike anyone alive has ever experienced along this part of the coast. 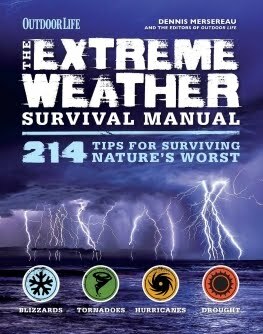 Please take this storm seriously, even if you're hundreds of miles inland.